Yuppy Puppy is your one stop shop for all of your pets needs. Our experienced pet stylists offer the the best services in the pet grooming industry to your furry family member. Yuppy puppy has all different options to make your pet feel and look the best. We offer a social area full of fun and playcamp activities. Pick up and delivery is available to most of St. Charles County and our boarding is top of the line and staffed 24/7. Yuppy Puppy is family owned and has been in business since 2003. With two locations to serve you. Let one of our talented stylist create a custom look for your furry family member. Yuppy Puppy's Ivy League training school will have your pooch top of his class! Have a social doggie? Come let them hang out and play in one of our playcamp yards, groups are separated by size, and play style and activities change daily. Checking in to our hotel for a day or a month, care is top of the line and guests are treated like family. Yuppy Puppies Forever is a non profit organization designed to give orphaned pets a second chance. Our main focus being on displaced pets due to their deceased owners. 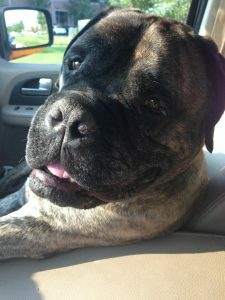 Simi (pictured) was a 4 year old Bull Mastiff whose elderly owner passed away. Jessica (founder of YP4ever Inc. and owner of Yuppy Puppy Pet Spa) adopted Simi and gave him a wonderful life when no one else wanted to take the time or effort of healing him of his grief. He lived the rest of his 6 years hanging out at the shop greeting clients, laying at home on the couch and chasing rabbits/geese in the backyard! He is our inspiration and we hope to help many more who may be unexpectedly put in Simi’s same position.